Thanks to Mendelssohn for this image. I don't think I'll ever forget that day when the apocalypse crawled out of the sea. At least, that's how it felt back then at the moment. 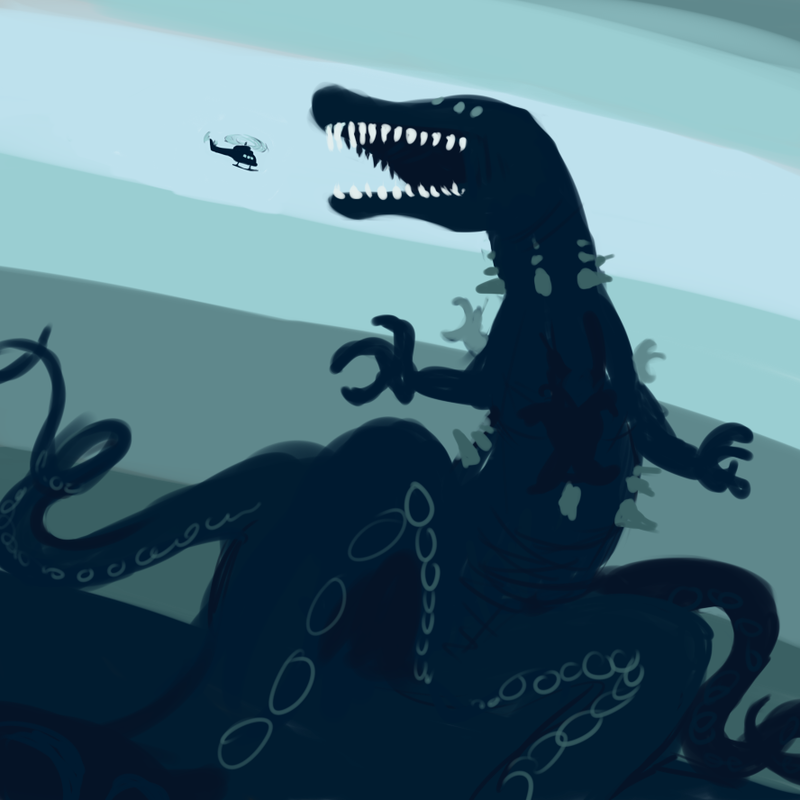 I was on the beachfront, and the kraken surged out of the water, crashing into the city itself. From where I was standing at the time it felt like the whole world was about to end. I'd never seen anything like, and I still haven't to this day. That thing was practically ripped from a kaiju movie, hundreds of feet tall and absolutely monstrous. You ever seen anything else with both arms and tentacles, not to mention five of each? I didn't think so. That thing destroyed Hy-Brasil. Yeah, I know that it didn't actually do too much to the city, but it crippled the city to the point where it'd never get better. I've stayed behind because I can't imagine leaving, but this city hasn't been the same since the attack. Hell, that's not even counting all of the fallout and complications resulting from the event. I still see MC&D churning out ads to sell the caviar they ripped from the squid twenty years later. Twenty years! And from what I hear, they've got enough stock left over to last them another twenty. It makes sense, I suppose. Hy-Brasil practically was the anomalous community at the time, and everybody who was living here at the time felt it's impact. It's not really odd that everybody who lived here would try to make something out of it, and get the most out of an awful situation like that. I'm not sure if we'll ever stop talking about it. LTE-0851-Cetus. The Crocodilian Kraken. The Crocosquid. The Reptilic Cephalopod. The Colossal Aquamorph Entity. The Dread Behemoth. 𒀭𒋾𒊩𒆳. The Squid Ispolin. Crocoteuthis gigantis. UAE-Brasil-78. The Tokage-tako. The Quin Krake. The Plokamisuchus. The thing that destroyed Hy-Brasil. There are some events that change the world, events of such great magnitude that everyone alive feels their impact. Not all of these events occur in the mundane world. On June 13th, 1988, a three hundred foot tall monster crawled out of the waters surrounding a mystical island out of Irish myth and besieged the land before it was killed. In the aftermath, the island was left ruined and desolate. But the story doesn't end there. The fallout and the aftermath of this event still continues to this day. Powerful groups attempted to exploit the events of that day, bending what happened to their own myth. There are not many commonalities within the anomalous community, but one was forged upon that day. Some Foundation canons focus on different worlds, with great differences from the "core canon" of the SCP-verse. Others focus on different groups of interest, or branches of the Foundation. This one is a bit different - it focuses on a singular event and the aftermath of it. War on All Fronts is a canon that exists in a mostly traditional view of the SCP-universe. It's less of a "different world" but an overaching plotline that exists in a standard interpretation of the SCP-verse. All of the major GoIs are in play, they all act according to their normal plan. The Masquerade exists, and everything is, (for the most part) normal. War on All Fronts deals with a kaiju attack, occuring in 1988. This attack was devastating, and destroyed one of the largest anomalous freeport cities in the world. Almost every major Group of Interest got involved, and everyone wants a slice of the action. This was originally concieved as a project to incorporate one document of every GoI into a single, cohesive narrative, and evolved from that. While the eventual and ideal goal would be to have every single GoI format as a part of the canon, that's not the current plan. Right now, this is an attempt to create a living, breathing world. The world of War on All Fronts is highly interconnected, and intertwined. Events that happen are refrequently cross-referenced, and everything blends together into a fluid world. This is an exercise in cohesive worldbuilding. The Fivesquid: Our monster, the central point of the canon. By the time it attacks Hy-Brasil, it is a three hundred foot tall, firebreathing crocodile/squid monster. There are implications in that the GOC and SCP articles that it was either magical or divine, to some degree. It was originally kidnapped from an unknown universe by a group of researchers from the Alexylva Universe, for a Jurassic Park type zoo. An unknown group of belligerents attacked that zoo, and the Alexylva people ended up abandoning their park and sending it elsewhere - to our universe. It's also quite probably either/both divine and Fifthist in some regard. Notably, the Fivesquid had several million eggs. Most of these were collected by Marshall, Carter and Dark (along with the body) and sold off as caviar, but some were not. A few of the eggs reacted poorly to a Sarkic ritual, and hatched into baby kaiju. Hy-Brasil: Hy-Brasil is a mythological island in Irish folklore, off the coast of Ireland. It can only be reached for one day in every seven years, but certain beings - gods, monsters, faeries - can get there all the time. Unfortunately for them, the Fivesquid was one of these beings. Hy-Brasil was an major focal point of the anomalous world, with pretty much every GoI having operated out of the island, with the full blessing of the monarchy. However, the kaiju attack destroyed the place and left it desolate, resulting in it rapidly dropping in notoriety. Tuatha Dé Danann: Irish, elvish, fae. Very similar to baseline humans, with a few minor differences. All are low level Type Greens, many are also moderate Type Blues. Had previously inhabited the mainland of Ireland before a retreat to Hy-Brasil in 1468. After the fall of Hy-Brasil, a small number remain on Hy-Brasil, but most disperse to other places worldwide. King Nuada: Nuada was the High King of Hy-Brasil, who ascended to the throne in 1810 and soonafter ended the isolationist period that had lasted for approximately 350 years. He rules until 1988, dying at an old age during the Fivesquid attack. He is succeeded by his nephew - Delbáeth - as his daughter also died during the attack. Politically, Nuada sought to create a land where the anomalous could be brought out into the light of day, and rule over a neutral-ground. He faced opposition from some of the more conservative elements of the Hy-Brasil court over this. Personally, he wanted gold and glory, and saw his actions as a safe way to do that. This canon is not strictly composed of tales. Get creative— make a GoI format, heck, any kind of format. Nx-03 is about the legacy of the kings of Hy-Brasil, and how Nuada's is stolen from him. LTE-0851-Cetus prominently features the fallout from the deployment of a dangerous weapon. Kaiju Caviar features the consequences of Carter being an idiot. Restless Dreams is how events linger in the public conscious long after they have passed. SCP-3741 has a smaller scale, but has the immediate consequences of stealing memories. The entire Apocalypse Arc is about the fallout from a failed Foundation project. The canon was originally conceived as an attempt to blend every GoI article into a single, cohesive storyline. This idea was somewhat abandoned, but we had plans for every GoI to get involved. The best way to add to the canon - but by no means the only way - would be to fill out some of those canons. Nota bene — the Apocalypse header represents the contribution of Team Mikasa to the Doomsday Contest from 2018. You're welcome to draw on the articles within, but add entries to the Aftermath section (or talk with stormbreath and we can work something out). stormbreath is in charge of the canon, and I'm active on both IRC and wikidot PMs. If you have any questions, shoot me a PM and I'll get back to you and answer any questions you might have about the canon. Also - please contact me prior to posting, for crit and review.